Stop The Plague Returning To Edinburgh! Rats have been spotted all over Edinburgh and there are fears that they may be spreading The Real Mary King’s Close plague! 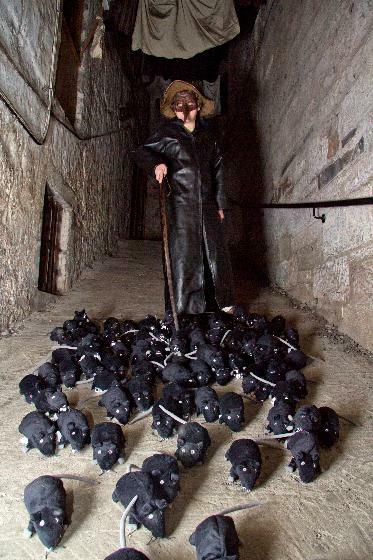 Hundreds of black soft toy rats are lying in wait around the city and it’s up to the residents of Edinburgh to find them, before the city’s legendary plague doctor does! From Monday 7 until Saturday 12 November, there will be rats hiding in various locations around the city including visitor attractions, landmarks, phone boxes, bus stops and shopping centres. They are being tracked down by the terrifying looking beak-masked figure of Dr George Rae, who normally resides deep beneath the Royal Mile in the award-winning Real Mary King’s Close. Everyone who finds a soft toy rat will be able to claim a prize by following the instructions on the luggage tags attached to the cuddly creatures. The lucky finders of the ‘King Rat’ each day will win one of six star prizes donated by award-winning hotel group Malmaison and its sister company Hotel Du Vin. Other prizes include high street vouchers, champagne and free tickets to The Real Mary King’s Close.During the bubonic plague outbreak of 1645 anyone who came into contact with a rat was likely to catch the plague. Scotland lost over a quarter of its population as the plague raged throughout the country. In plague-ridden Edinburgh, the contagious disease spread like wildfire but some how Dr Rae never caught it and went on to earn an unprecedented yearly pension of £1,200 Scots for his services. Followers of the Real Mary King’s Close on Twitter and Facebook will be given daily clues to help them seek out the rats. In addition, breakfast presenters on local radio station Forth One, will be giving out clues to the whereabouts of their very own ‘King Rat’ This will hold the biggest prize of the week..
Seek them out before it’s too late! Previous PostPrevious Mary King’s is top for Edinburgh residents! Next PostNext Hola Isobel de Toledo!